As I have minimised and streamlined my wardrobe over time, it has become increasingly important that individual items are able to be worn in a multitude of ways. Everything is multipurpose to some degree but I think this piece is a clear winner. We live in a relatively temperate climate where the maximum temperatures range between about 15C and 35C and the minimums between about 5C and 20C. Consequently, we can wear variations of the same outfit for much of the year. The skirt shown above is a lightweight seersucker cotton fabric which is lined with an equally lightweight lining. On the hottest days I can pair it with a sleeveless white cotton shirt and a pair of strappy black sandals. 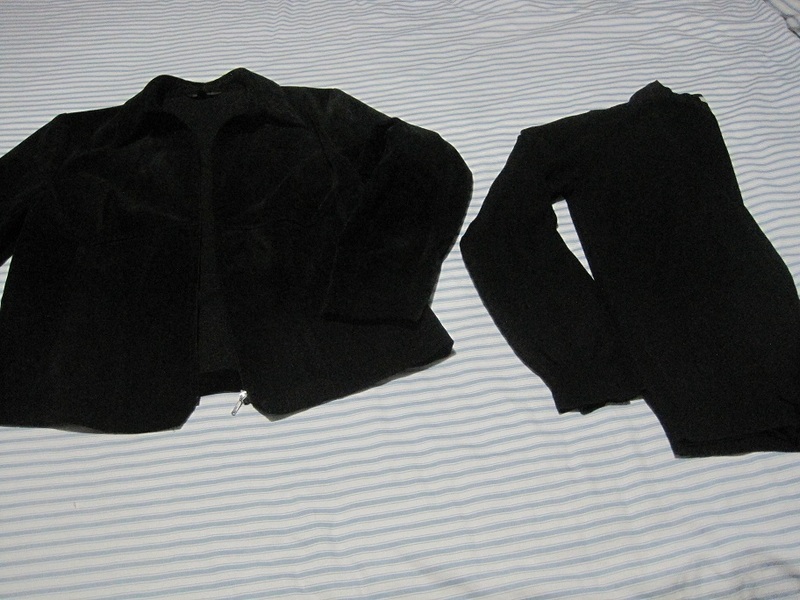 Conversely, I have also worn it with a grey cowl-neck pullover, red trenchcoat, scarf, tights and knee-high black boots. 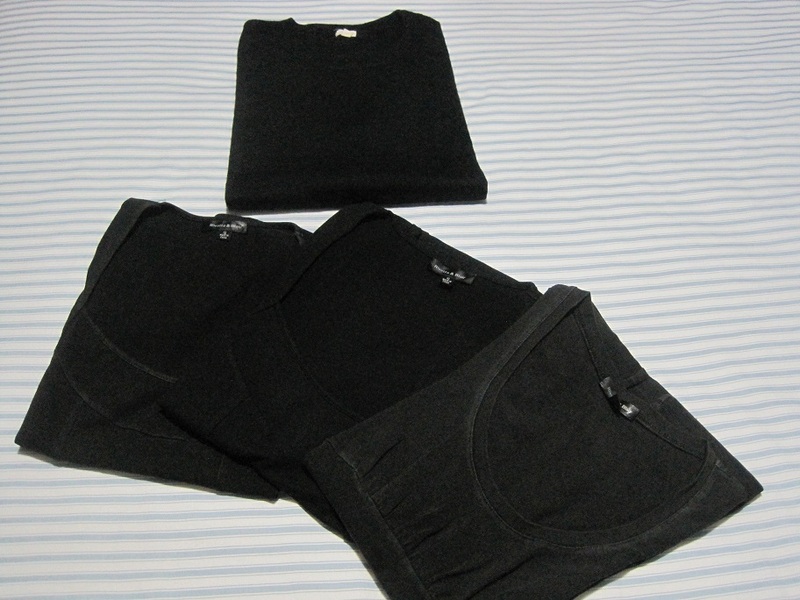 There are plenty of options that fall somewhere between these two extremes as I have a fitted black tshirt as well as a short sleeved black cashmere pullover. A couple of different white shirts and a black cardigan complete the mix of tops. A pair of black heels provides another option between the sandals and boots. These are just a few of the possibilities which work with this skirt. A relatively small selection of clothes means that each piece needs to really earn its keep. No, it is not a new card game. 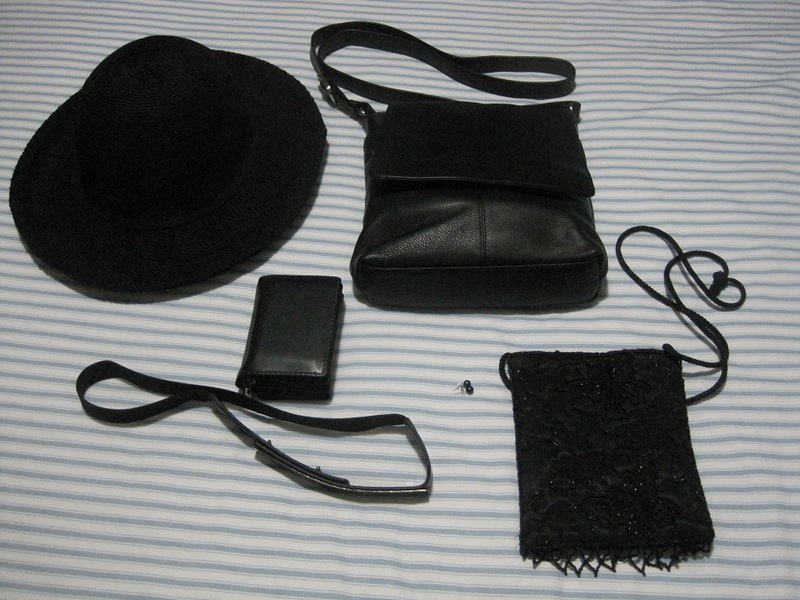 21 is the number of black items that I have in my wardrobe. They are not patterned or black with the addition of other colours. Those are extra and yet to be counted. 21 seems like a lot of things in just one colour for what is a fairly small wardrobe. These are my staples which means that I can mix and match with everything else. Take a look and see what you think. 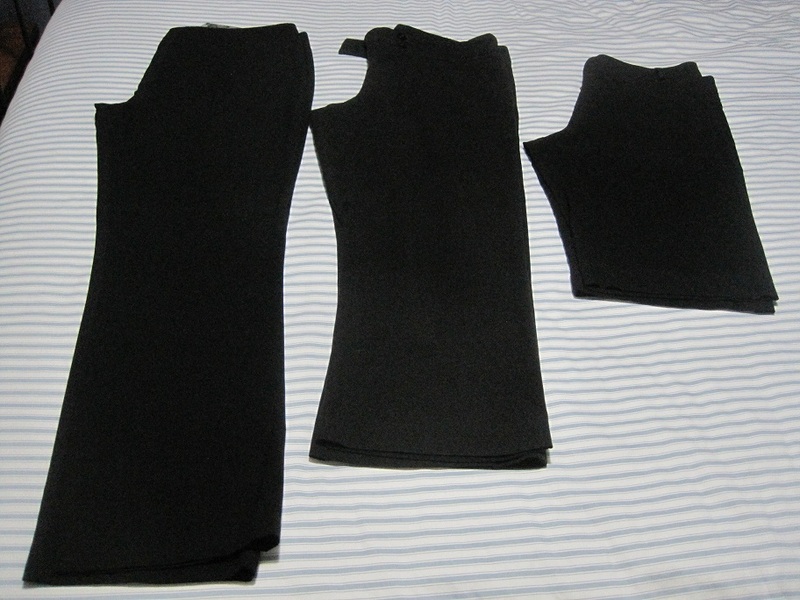 One pair of trousers, one ¾ pants and one pair of shorts. 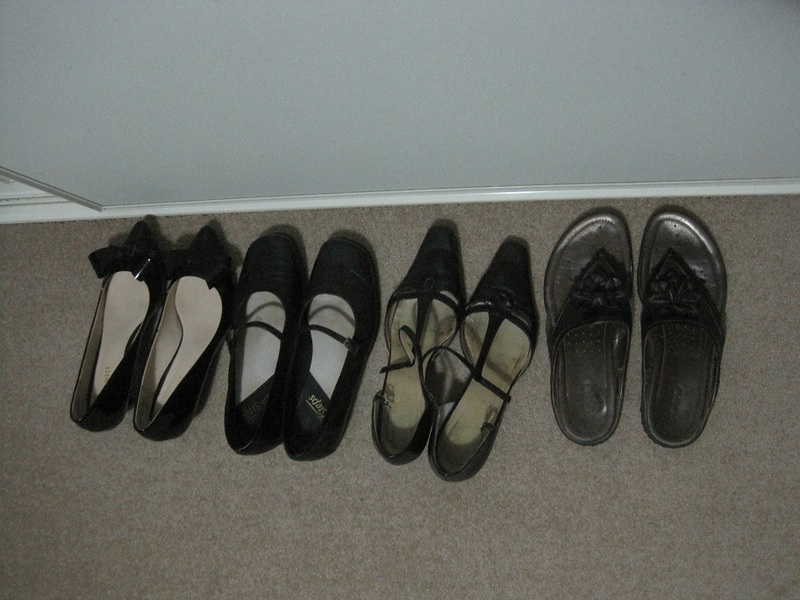 There are really very few duplicates in this selection and they are all worn or used on a regular basis with the exception of one pair of heels and the evening purse. The other thing to note is that several of these items are the only one that I own. The trousers, wool sweater, all of the shoes, handbag, evening bag, wallet, hat and belt are not duplicated in any other colour. 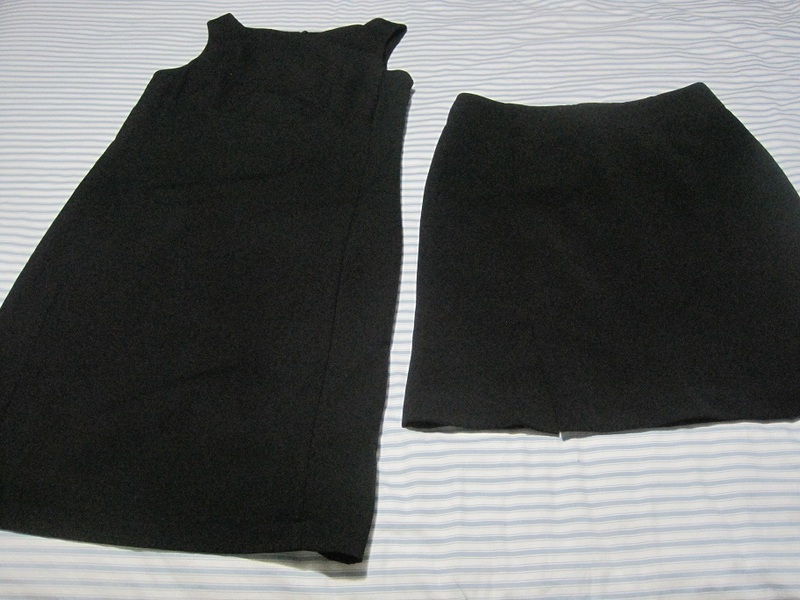 Although I do own other dresses and skirts, the black ones shown here are the only plain-coloured ones in my wardrobe. Black is undoubtedly the base colour in my wardrobe. The secondary colours are red and white and I will look at these another day. Do you have one base colour or several upon which to base your wardrobe?